Of course it counts as the theme. - I visited a bird park too! I do admire the delicate colours in these cards. Hi Little Nell, Thanks for stopping by! I'm glad you like these postcards. I think they are quite pretty too. Which bird park did you visit? Thanks for your comments. I appreciate it very much! Beautiful cards, Jana. I'd like to see a white peacock. Hello Wendy! I'd like to see a white peacock too. I didn't even know they existed until I replied to your comment. My daughter saw some in Northern Italy, so I know they exist. Isn't that a peacock on that postcard? How fun for your daughter...both seeing the white peacocks and for traveling to Northern Italy! 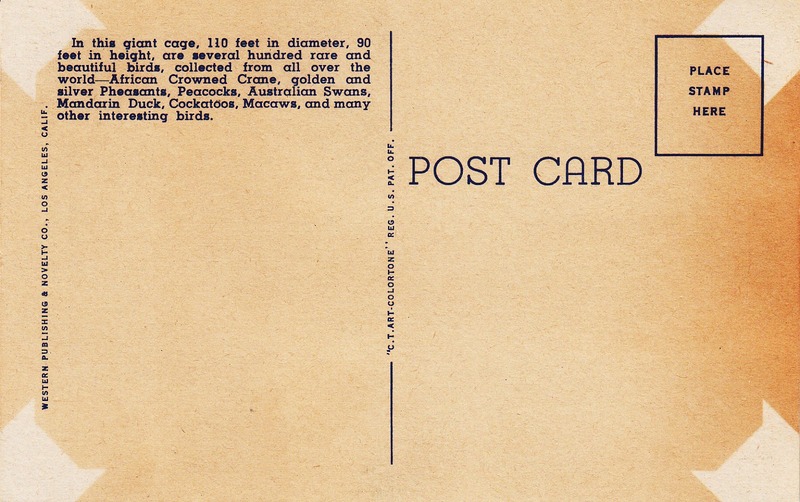 I did a little Google search for white peacocks and from what I can tell, yes, that is a white peacock on the postcard. They look so elegant don't they? I wondered what the birds with the long white tails were called; can they be white peacocks? Hi Bob! 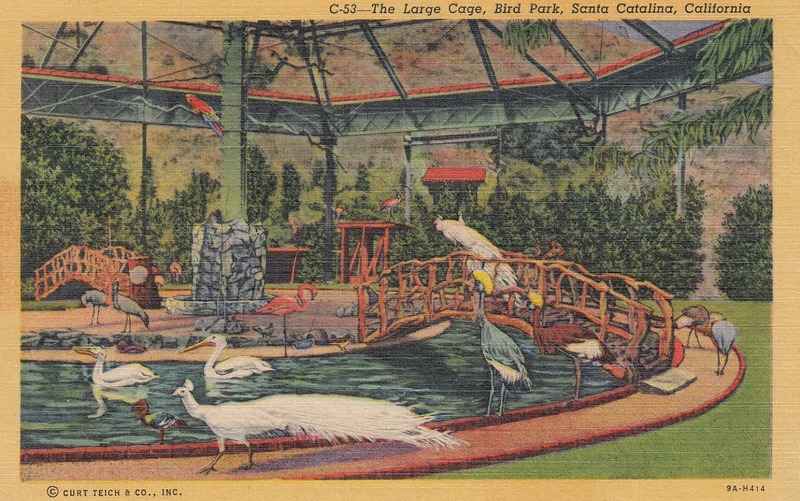 I did a Google search for white peacocks and sure enough, that's what they look like on the postcard. They sure are pretty! Love the bird postcard. Great subject to collect! My grandfather used to live next to a bird park and I always remember hearing the exotic birds in his garden. Nice post. Wow, your grandfather used to live next to a bird park? That would be quite interesting for sure. Wow white peacocks. Perfect for today's theme. Learn something new on every post. Thanks Peggy! Yep, I'm glad I was able to share these postcards with the theme. 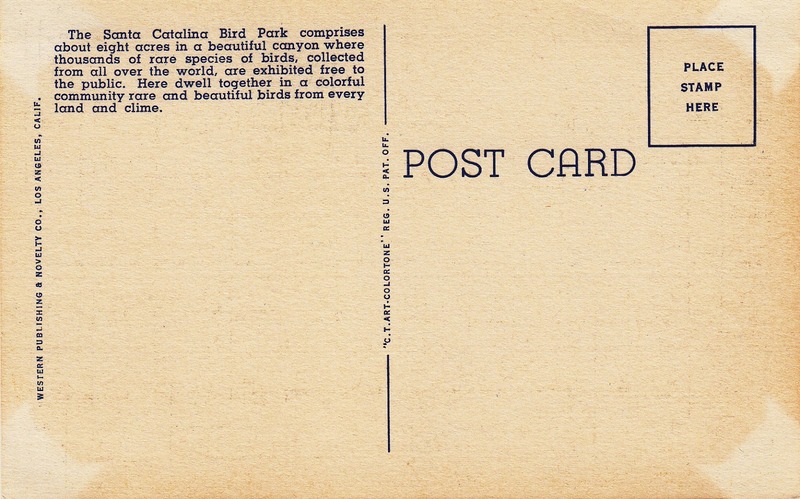 Agree with everyone that those are lovely postcards. Your grandfather really collected some treasures for you to explore -- so glad you are now able to blog about them! Thanks ljhlaura! My mom found more of his postcards and brought them over today. So fun! I enjoyed reading this post. It's interesting how tourist attractions ebb and wane over time. Thanks so much for stopping by my blog and for your comments! I just checked out your blog and I love it. The concept is awesome! Thank you so much Susan! I'm honored! We live next door to a forty acre ranch and I can hear peacocks on the property but never see them! My cats most likely discourage visits. The sound is exotic and I love it - now I'll dream about them perhaps being white. Thanks so much for reading and for your comments. I appreciate it. Love the postcards! Thanks so much for posting them. Here in New England we hear a lot about Catalina Island, but don't see many images of it. Our daughter's name is Catalina, and many people assume we named her after a trip to the island. She is actually named after a castle we stayed at when visiting my husband's relatives in Spain. 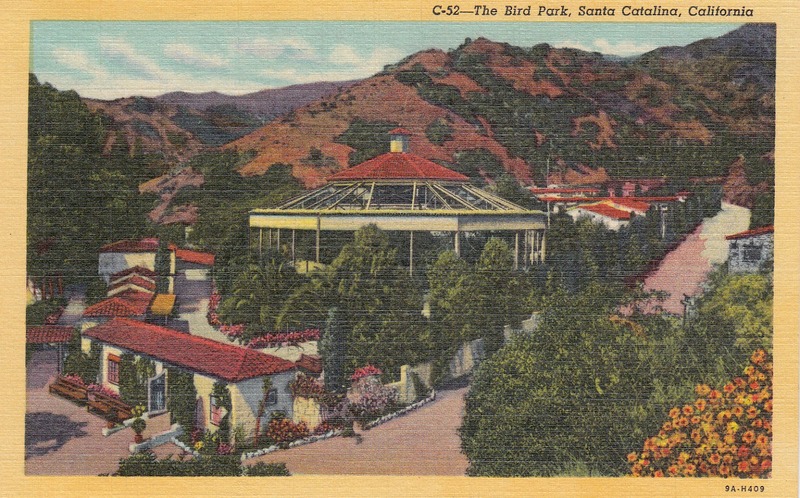 I like the old photos so much more than the new photos of Catalina Island. Hello Heather, Thanks for stopping by and reading my blog! Your daughter's name is beautiful! How fun to be named after a castle!